The Nigerian president Muhammadu Buhari has pledged to end the killings in the restive regions of the Middle Belt, amidst growing pressure to deal with the situation. A spate of attacks over three days – from Friday 22 to Sunday 24 June – left more than 200 dead in 11 villages, in three local government areas of Plateau state. That violence was the latest episode in a series of attacks targeting predominantly Christian communities in the Middle Belt. 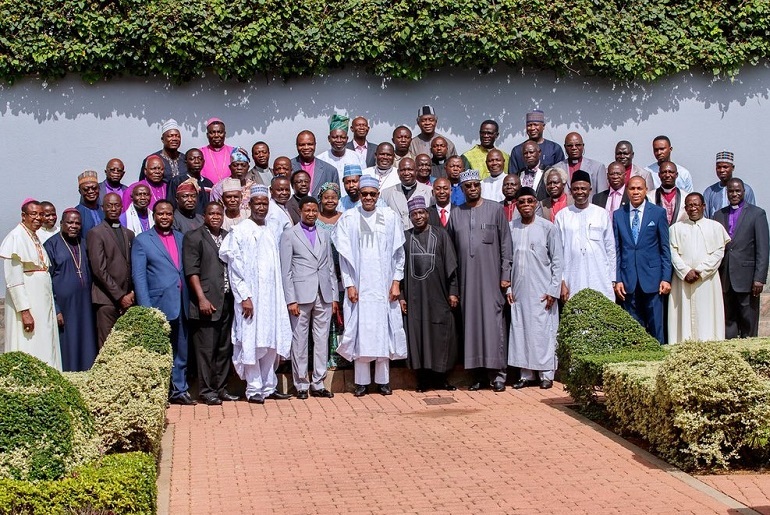 Yesterday, 5 July, as he met with leaders of the Christian Association of Nigeria (CAN), from 19 northern states and the Federal Capital Territory, President Buhari described the recent killings as “wicked”, “condemnable” and “completely unacceptable”. “We owe it to the memory of those who lost their lives in the violence in Plateau, Benue, Nasarawa, Taraba, Zamfara and elsewhere since 1999 to bring the conflicts to a decisive end, I assure you that we will do this,” said Buhari, adding that “even a single life lost in any part of the country is one too many”. Two days earlier, on Tuesday 3 July, the Catholic Bishops Conference of Nigeria (CBCN) had called on Buhari to resign in order to “save this country from further pain and avoidable chaos, anarchy and doom”. In a statement signed by Msgr. Augustine Akubeze, the president of CBCN, the bishops said they were “devastated by these acts of insensitivity and disrespect for the dignity of human life”. “If the president cannot keep our country safe, then he automatically loses the trust of the citizens. He should no longer continue to preside over the killing fields and mass graves that our country has become,” they said. It’s not the first time the Catholic bishops have asked President Buhari to step down. Two months ago, they expressed their concerns over the inability of the government to deal with the situation, in the wake of the massacre of 19 worshippers including two priests in Benue state on 24 April. “The latest horrendous massacre of scores of innocent Nigerians, especially children and women – including pregnant women – in Plateau State, by the same rampaging and murderous terrorists who now seem to be operating without any hindrance in the Middle Belt and other parts of Nigeria, shows that our last statement, like all the others before, has been completely ignored by those whose primary responsibility it is to protect the lives and property of Nigerians,” the bishops said. They also denounced the alleged complicity of security forces in the hundreds of recent killings attributed to Fulani herdsmen. Buhari, who is seeking a second term in the upcoming February 2019 elections, has been criticised by many, including human rights groups, clerics and analysts, for his perceived lukewarm attitude towards the herdsmen responsible for the deadly attacks in the Middle Belt and north-eastern states. In 2015, he was elected with the promise to silence Boko Haram, whose nine-year-old insurgency had claimed more than 20,000 lives, particularly in the north-eastern states of Borno, Yobe and Adamawa. So far, Buhari has failed to curb the Islamist insurgency. Moreover, the country has been plagued by Fulani attacks, responsible for more killings than Boko Haram over the past three years. In a statement last week, Amnesty International revealed that over 1,800 people were killed between January and June as a result of attacks often portrayed as a “farmer-herder conflict” or “communal clashes” – though analysts have refuted this – as well as Boko Haram attacks and other banditry. The figure, which included killings in 17 out of Nigeria’s 36 states, was almost double that of the whole of 2017, when 894 are known to have been killed. “The authorities have a responsibility to protect lives and properties, but they are clearly not doing enough going by what is happening,” said Osai Ojigho, Director of Amnesty International Nigeria. He also called on the authorities to investigate the recent massacre in Plateau state. “Making arrests and bringing to justice those suspected to be responsible for these attacks is crucial in ending the killings that are gradually turning into almost a daily occurrence. In many instances these killings happen and no arrests take place,” Ojigho said. Barkindo highlighted the recent conviction of five Christian youths, who were sentenced to death over the killing of one Fulani herder by a court in Yola, the capital of the north-eastern state of Adamawa. The five convicted young Christians are said to be members of a local self-defence group, who had decided to defend themselves and their community. The persistence of attacks also prompted the former Defense Minister, Gen. Theophilus Danjuma, to call on people in his home state of Taraba, in the Middle Belt, to stop depending on government security forces. He said: “You must rise to protect yourselves from these people [Fulani herdsmen militias]. 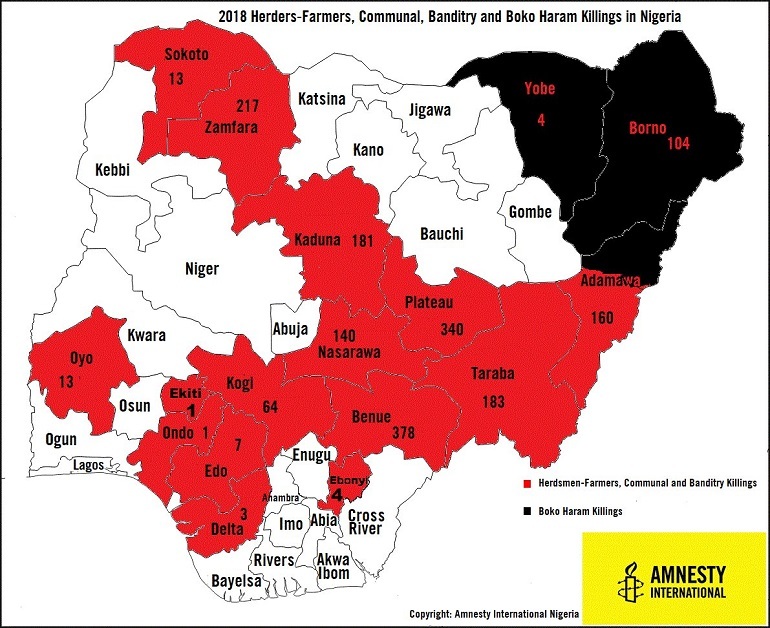 This echoes a previous report published in 2013 by Human Rights Watch, which found that the failure of authorities to bring those responsible to justice is one of the major drivers of the cycles of communal violence in Kaduna and Plateau states.